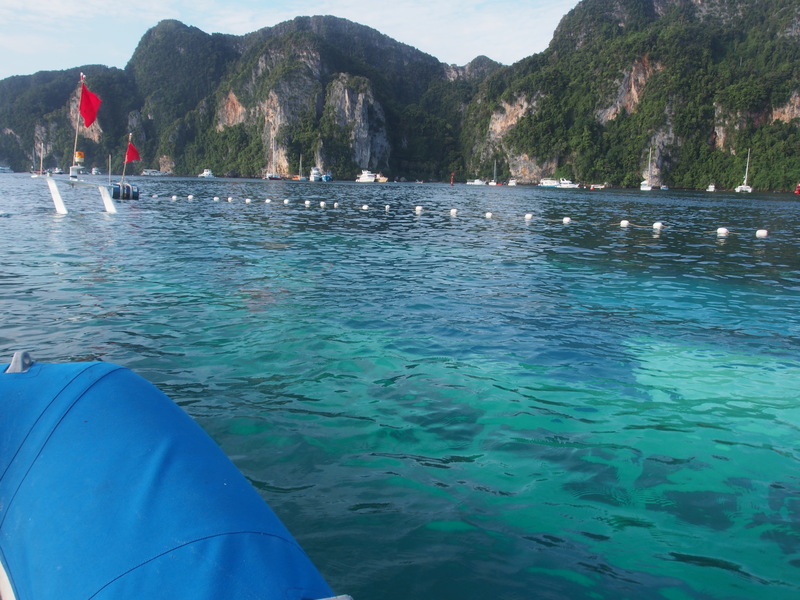 We recently completed a trip from Langkawi to Ao Chalong, Phuket. It was what I call done in the shoulder season. By that I mean it’s the time of the year when the seasons are changing. Here in Thailand/Malaysia we are changing from the south-west monsoons to the north-east monsoons. It’s a tricky time of the year as the wind can come from any direction. We were confident that we would be OK weather-wise. We have been in the area now for almost a year and we have rarely seen the wind blow from the same direction with any strength for more that a few hours. However, we were caught out this time. We left Khua, Langkawi and headed over to Telaga, on or our favourite anchorages in Langkawi. The wind was from the north-east which it had been blowing for the last week and our thoughts were that the north-east monsoons were settling in and our guest, Sandy from Edmonton, would enjoy a trip north with us. 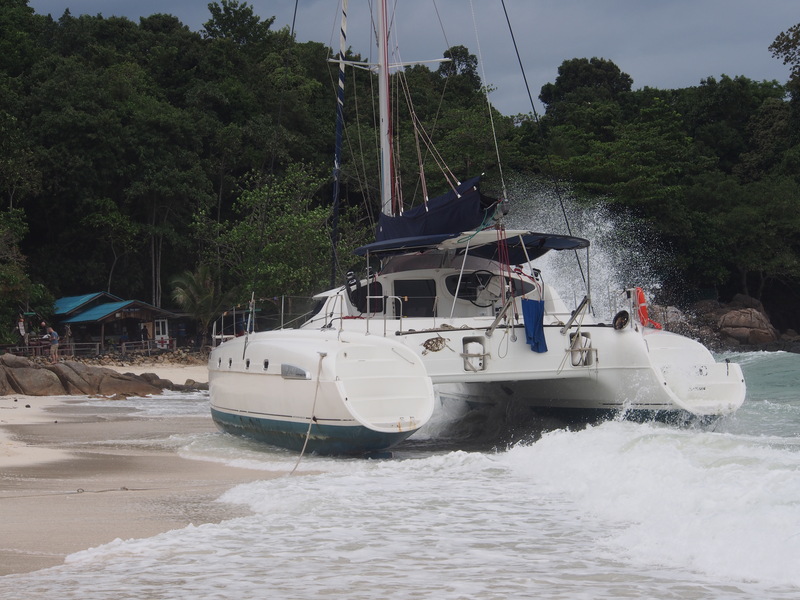 We anchored in Telaga for the night and with predictions of a bit of a blow and a low coming in we left for Koh Lipe. The prediction was for the wind to change directions and come from the southerly quadrant. We headed up to the north-west coast of the island despite the wind coming from the northerly sector making the anchorage a little jumpy. Sure enough that night the wind changed to a more southerly quadrant and the bouncing anchorage became smoother. By nightfall the wind was up, local fishing boats were coming into anchor, rain had been blowing hard for two days and were not at all comfortable. Night was no better especially when the wind shifted to the south-west. By morning we could not see the boat next to us as it disappeared in the swell. Time to move. Local boats were calling us to follow them so up with the anchor and off to the east side of the island. We were finally in some degree of comfort with the seas calmed by the island but we were tired of being trapped on the boat so headed ashore. And the day after we left for points north. 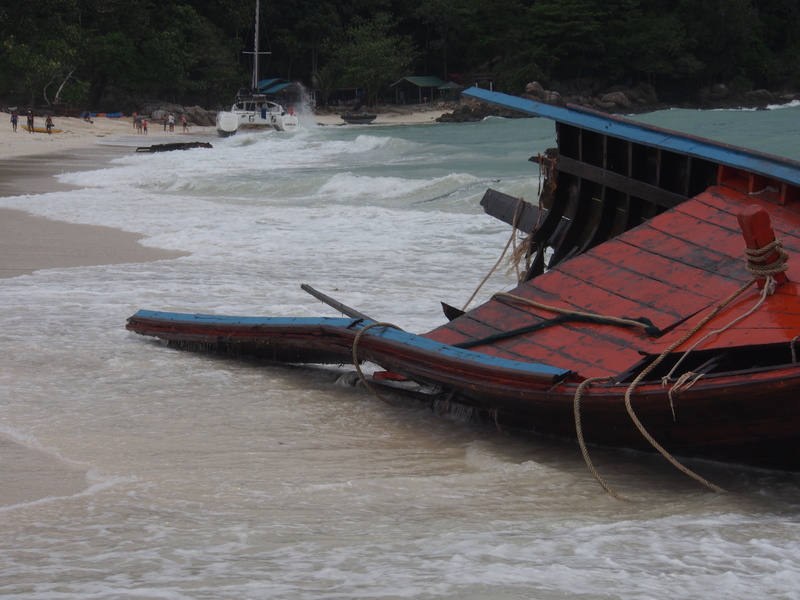 What follows are a few pictures of the storm’s aftermath in the various places we visited as we made our way to Phuket. This is all just a reminder to us at sea that we too could possibly end up on the beach in a storm but we hold on to our luck and hope for the best. So eerie seeing that boat just under the surface! Glad you weathered everything – have been thinking of you two lots over the last while! Give me our land yacht any day! Minus eight degrees here at the moment. With wind chill factor -20! The only boats on the beach here should be. Glad you made it through, hope that was a one-of experience. Glad to hear you guys are ok after all the horrible storms you’ve had in that part of the world. I hope you have a Very Merry Christmas and a Happy New Year! 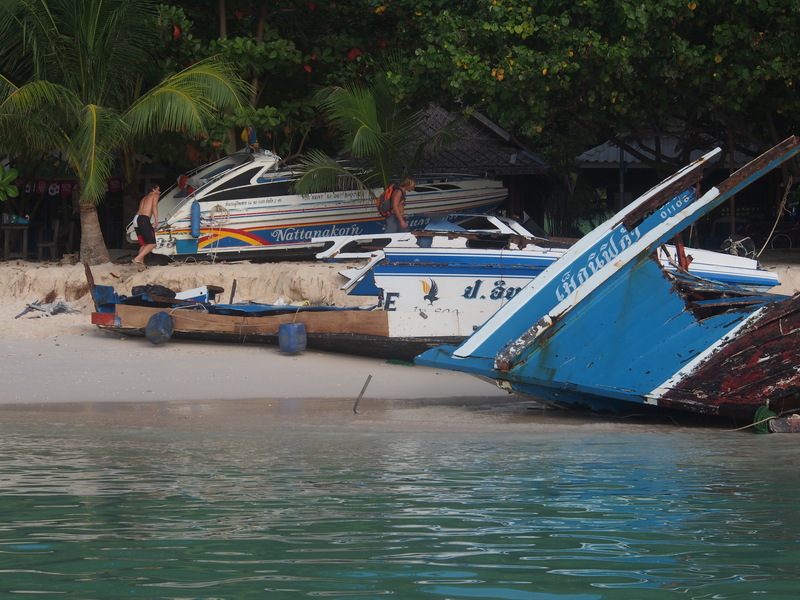 Apparently the boat that sank in Koh Phi Phi harbour could carry 400 passengers. From the look I had the would have had to be jammed in like sardines. At least no-one was onboard when it sank.